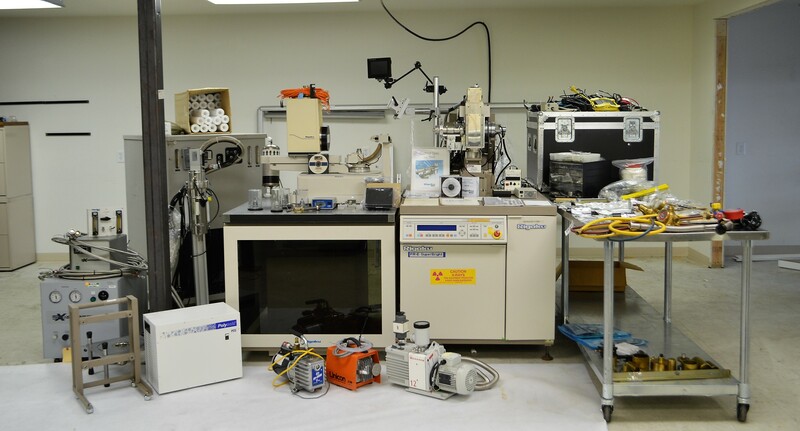 Rigaku FR-E SuperBright Macromolecular X-Ray Crystallography Diffraction System . New Life Scientific, Inc.
Includes Software, Chillers, Numerous Parts and Acc. MANY additional photos available. Please inquire and we'll be glad to provide them. Our in-house technician did not power this instrument on, but they evaluated its physical condition for completeness and care. The product shows signs of age, but it is in good cosmetic condition. There are a number of accessory instruments, parts, and an enclosure to complete this system. NLS does not have the experience or training to correctly assemble and test this system. Please contact us with any questions or requests, so that we may better provide you with customer service and sale details. The Rigaku FR-E and accessories are in good cosmetic condition. There may be signs of wear including nicks and faded paint, but the product has aged well and appears to be ready for assembly (prior to application). Please contact NLS for more details or requests regarding the accessories.